Adam Jamieson’s return to Mornington and Baxter’s escape from relegation are the major stories to emerge from last weekend’s final round of the league season. Mornington will announce this week that Jamieson has been appointed as head coach for 2019. It will be his second stint at the club after stepping down last May citing work commitments as the main reason for his departure. Jamieson first took the reins at Dallas Brooks Park in 2009 and led Mornington from Provisional League to the doorstep of the NPL winning State 1 championships in 2015 and 2016. “A big part of taking on the job again is having Nathan Peel as my assistant,” Jamieson said. Peel is a former English professional who has been on the books of Preston North End, Sheffield United and Burnley and is the principal of Absolute Soccer academy and former director of coaching at Mount Martha soccer club. “Nathan said he’d only come in if I was involved and that’s what started me talking with some Mornington committee members again and here we are,” Jamieson added. Jamieson will also look closely at Mornington’s junior structure while Peel will be involved with coaching education at that level. “I think we have to probably stop looking overseas to some degree and start looking at getting results with local talent if we can,” Jamieson said. He has hit the ground running having already agreed terms with an NPL striker and is rumoured to be holding talks with a goalkeeper this week. Mornington ended the State 1 South-East season with a 3-1 home win over Malvern City last weekend. Keegan Ziada (2) and Andre Bennett scored for the home side. Meanwhile Baxter completed the great escape on Saturday with an 86th-minute Mark Pagliarulo goal giving it a 2-2 draw at home to championship aspirant Springvale City. The result saved Baxter from relegation and pitched Springvale into a promotion play-off after it finished runner-up to Monash Uni. “Pags” came out of retirement to play the last few games for Baxter and has now written a climactic final chapter to his already colourful career there. He ensured a nailbiting end to a topsy-turvy season with a looping header from a Ben Meiklem free-kick that sent Baxter fans into raptures. Baxter had taken the lead in the 22nd minute when Jake Kidder headed home Dan Disseldorp’s cross. Five minutes into the second half scores were level after a Jullet Martin strike was deflected past Baxter keeper James Foster. When Daniel Vargas went down inside the area in the 71st minute and Arnel Zahirovic converted from the spot to make it 2-1 Baxter was teetering on the edge. Springvale was within touching distance of the title until “Pags” spoilt their party and started one of his own. Baxter senior coach Roy Kilner stepped down after the match ending his second stint with the club which now is on the lookout for a coach for the 2019 season. In NPL2 news Langwarrin failed to send Gus Macleod out on a winning note when it went down 1-0 away to Melbourne City on Saturday. A Sam Morrison goal in the 65th minute proved decisive. In NPLW news Southern United lost 4-1 at home on Saturday to Senior NTC. The visitors hit the front in the 20th minute when Southern keeper Freya Crocker did well to get down and parry but the rebound was slammed into the roof of the net by Georgie Richardson. A Holly Furphy tap-in in the 20th minute made it 2-0 but great work by Southern’s US import Michaela Dooley down the right three minutes from half-time was capped by a superb cross and a simple close-range finish from Sarah Wieck to make it 2-1. A back post header from Shaelan Chamoun in the 55th minute made it 3-1 and Ashley Jordan completed the scoreline in the 66th minute after winning possession and striking a low shot inside the far post. Earlier in the day Southern’s under-16s lost 2-0 to league champion Mini NTC. Southern used the match as preparation for its upcoming finals campaign by using its under-14s knowing that its regular under-16s faced a catch-up match the next day. And although the elite NTC juniors enjoyed the bulk of possession Southern held them at bay and fashioned a handful of good scoring chances. NTC opened its account in the 19th minute after a superb turn and finish from close range by Sienna Cappola. NTC’s Silver Bell Morris played an excellent through ball in the 36th minute and Cappola cleverly lobbed the ball on the volley over advancing Southern keeper Caddy Vakacavu from the edge of the area. Southern’s under-19s lost 8-1 to Junior NTC with Stara Karimi scoring for Southern late in the match. In State 2 South-East news, Peninsula Strikers lost 5-3 away to Mazenod on Saturday. The result sent the home team into State 1 next season while Strikers had already cemented their place in State 2. The news wasn’t good for Frankston Pines though as last weekend’s 4-1 loss away to Doncaster Rovers anchored the local side to the bottom of the State 2 South-East ladder and condemned it to the drop. James Kalifatidis (3) and Masayuki Hata scored for Doncaster while Mitch Landers scored for Pines. In State 3 South-East news Skye United finished the season with a 2-2 home draw against Brighton on Saturday. Cam Leopold notched a double for Skye while Brighton’s goals came from Michael Knott and a Billy Painting own goal. 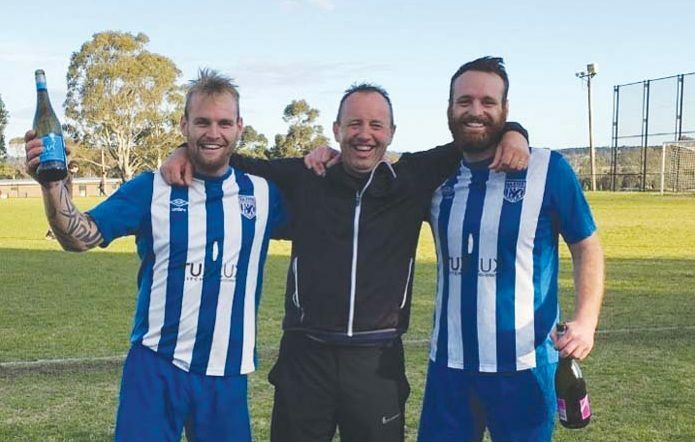 Harry McCartney reports that nine-man Seaford is clinging to the faint hope that it has given itself a State 3 lifeline with an amazing 3-2 away win over Noble Park United last weekend. Seaford hit the lead in the 13th minute after good work from youngster Cody Storton-French earned a corner and Noble Park’s botched clearance from the set piece was met by Matty Schwellinger whose half-volley went in off the crossbar. Nine minutes later Conor Mcfall was awarded a dubious penalty and Dean Snoxell converted to make it 2-0. In the 38th minute Seaford was caught square at the back as Vojislav Milojevic ran onto a Nicholas Andrejic through ball for an easy finish past Seaford keeper Anthony Madafferi. Eight minutes into the second half scores were level as Seaford was hit on the counter attack allowing Denny Bejan to tap in from close range. Seaford’s hopes took another hit in the 84th minute when Matty Schwellinger was sent off for swearing after being on the wrong end of a late challenge. But a minute later another Seaford youngster, Mitch Hawkins, met a bouncing ball and lobbed it from 25 metres over the advancing keeper to make it 3-2. In the 88th minute Mcfall received a second caution making for a nervous finish as the referee found six and a half minutes of injury time but Seaford somehow held on. The result means Seaford finishes second bottom and seems certain to be relegated albeit that it thinks it may benefit from the domino effect of Morwell Pegasus’ withdrawal from State 1 South East. In State 5 South news Somerville Eagles’ promotion push ended in a heartbreaking 1-0 away loss to Pakenham United on Saturday. Against the run of play Pakenham’s Simon Johnstone-Robertson scored in the 78th minute and the home side held on. In injury time Pakenham’s gamesmanship took its toll with a second yellow card to Damian Finnegan and a straight red for James McKenzie summing up an afternoon of frustration. Somerville player-coach Dave Greening lauded the efforts of his players after the match. “Obviously at this stage emotions are raw and we are all disappointed. The lads are devastated,” Greening said. Aspendale was thumped 6-1 at home to Knox United last weekend but despite the loss the club consolidated its status in its first season in State 5 South. SATURDAY 10.15am: Southern Utd v South Melbourne (U14 semi-final, Monterey Reserve).